Because Atticus Finch just ain't enough, I write about education, values based living, typewriters, and much more. Box arrived in good condition, especially considering it went from Germany, to Washington DC, to China. Case seems to be in fine condition. Machine well packed inside the case. The green version is my favorite. Certain typewriters belong in certain families, and I can think of no better typewriter for the son of a US diplomat (not me, my wife) than the Underwood Golden Touch Diplomat. I had been looking for a machine as a birthday gift for my son and saw this on eBay for a reasonable price (Because he is turning six in two months, I was not willing to pay as much for my son's machine. He still treats many things with less delicacy than an older person would.) At first he wasn't thrilled with the unsexy looks of the utility grey. He liked the glass keys of his sister's machine and the bright colors of other more expensive machines (Royal QDLs, Princess 300s, and Groma Kolibris), but he changed his tune when I told him that this typer was named after mommy's job. He was sold, and I negotiated an acceptable price with the seller. I have been pleasantly surprised by how well the machines I have bought have been packed. I don't want to push my luck, but I am three for three. I have sent to each of the sellers a link to how to pack the typewriters well, and they have each followed those instructions. This third seller, though, should teach classes on how to pack a typewriter. She achieved perfection. The box came undamaged (again, I live in China, so the typewriters travel a long way to get to me), and when I opened it I saw nothing but a thick piece of green foam. That foam covered the bottom and top of the box, and it was placed on all four sides of the typewriter's case. As you can see in the photo above, the seller also packed the corners of the box tightly with packing paper and wrapped plenty of bubble wrap around the case. That typewriter was not going to move in that box, no matter how much it got tossed around by hurried shipping employees. After opening the case, I also discovered that the typewriter had been generously covered with bubble wrap and the typebars had been packed down with newspaper. My son also received some unexpected ephemera. I love that in 196x, a pack of carbon paper was only 15 cents. None of my kids had ever seen carbon paper before, so this was a treat for everyone. The original instructions telling us how to unpack the typewriter were also in that folder. And my son stepped away from his machine for a second, so here's a look at the typeface. I do need to clean the machine and change the ribbon. I am happy with this purchase. I find something attractive about a machine meant to serve a singular purpose and designed simply to serve that purpose. This machine is heavy, feels solid, and has few physical blemishes. The keys offer a nice resistance when I push them, and I am someone who enjoys setting key resistance as high as possible. I like the feeling of work. I think I'd be happy writing often on this machine, and I am happy that it made my son happy. Funny thing, though. As my wife was looking at the machine, she turned to my older daughter and said, "Now we're the only ones in the family without a typewriter." To make a long story short, I need a machine that is more portable than my SM9, so I will buy another typer that my oldest child can use and that I can cart from place to place. I may also get to buy another for my wife. Two things I desired showed up in the mail today, my daughter's 1946 Royal QDL and my new printer/scanner. I need the printer scanner so that I can begin typecasting, but before setting that up, I wanted to write a bit about my daughter's first typewriter (and the second typewriter in my family's home). My daughter, Eleanor, who is eleven, spent a lot of time looking over my shoulder as I searched for my first machine. During that time she fell in love with shiny black typewriters with glass keys. She is a budding novelist (she's started two novels, one of 25,000 words and another of 13,000 words), and I wanted to encourage her writing, so I went looking for a shiny black machine for her. Because we live in China, eBay, Etsy, and ShopGoodwill are about our only options for buying typewriters at a price we can afford, but my wife's career gives us access to the US diplomatic postal service, so shipping isn't much of a problem--the machine just travels more distance. After spending a lot of time searching for my first machine, I began noticing that ShopGoodwill may actually have the worst value as far as quality for each dollar spent. Prices there seem to be going higher than I see on eBay. Etsy is usually more expensive, but I found a better deal there for my SM9. Nonetheless, I've discovered that the shiny black machines with glass keys are in demand and fetch high prices. However, my daughter also told me that the matte black finish is okay, as long as the typewriter has the glass keys in pristine condition. Luckily, I found the QDL for her on eBay at a price that I thought was fair. I waited until the final second to put in my bid, and I only had to spend four dollars more than the initial bidding price (but $28 less than the maximum price I was willing to spend). I paid for the machine immediately after winning the bid and sent a note to the seller with a link to how it should be packed. The seller wrote back and told me that the machine would be packed well, not referencing the link I sent her. I hate that kind of ambiguity. What might be "well" to her might not be well for a trip to China. In response, I sent her a note and told her that I copied the packing info into the text of my note in case she had trouble with the link I sent. And that reply may have made a difference because the typewriter was packed well. The entire package was wrapped in brown paper, and only one corner tore during shipping. The outer box was structurally sound, and inside that box the typewriter case was wrapped in plastic and wrapped in another box. I could quarrel with the amount of packing paper around the inner box, but I was just happy that everything seemed to be cared for and did arrive in the condition advertised. Inside the case the typewriter was packed tightly and the typebars were also packed down. I love the looks of this machine. I just keep walking over to it and staring at it. My daughter has already warned me about remembering that it's her typewriter, but she did also say that maybe once a month we could switch machines for the day. I couldn't imagine a machine being in better physical condition after 70 years (and the glass keys are in mint condition). In fact, because it came with the original warranty card, we know that this typewriter was bought on 2 November 1946 by Loretta Verte. I enjoy thinking about who Ms. Verte was, why she was buying this machine, where she bought it, and for what purpose she bought it. Maybe Eleanor and I can google that name later and see what comes up. While the typewriter did look beautiful, there were a couple of problems. It could use a new ribbon, but the one I ordered won't be here until Tuesday. That's not a huge problem, as my daughter has been enjoying working with the ink that's left--in both red and black. We've also discovered, however, that the backspace key and the bell do not work. (The backspace key moves the carriage back when pressed, but when you release the key the carriage moves back to its original position.) The machine could use a good cleaning, so we'll see what happens after that. Luckily, these are two problems that she can and is willing to work around, and they are two problems that may be able to be fixed, if not by me one day, then by a repairman somewhere. Overall, I am very happy with this machine and my SM9. And there is already a third on its way, a typer for my son, who will be six in March. Thanks for reading, and please lookout for my first typecast. The plan is to discuss my rules for the typewriters I purchase. Today, it arrived, my birthday present, my Olympia SM9. It's either a 1966 or 1967 model. The serial number, in case someone can let me know the exact year, is 3054506. It came in a box that had been damaged: the box had been slightly bent and a hole had been put into one side. That damage, however, didn't matter because the seller (I bought it from a very nice woman on Etsy) had packed it just as I had suggested. This especially pleased me because the typewriter went from California to Chicago and then on to China, where my family and I live. I tried visiting antique shops here looking for a typewriter, but they are scarce and overpriced. Shipping one was my only option. Beneath a layer of edible packing peanuts was an SM9 case wrapped in bubble wrap, and within the case was a typewriter wrapped in packing material. I'm not sure what the odor was emanating from the case, but it wasn't pleasant. I didn't detect mold, but maybe some cigarette smoke mixed with moth balls mixed with a musty feral cat. I have few words that really capture this unique and never before sensed smell. The typewriter didn't carry the odor, just the case. The stink did go away fairly quickly, especially after I wiped the case down. My older daughter doesn't think it's a very pretty machine, but I find the attraction in its utility. From what I've read this machine is a workhorse and one that should give me few problems. I wanted a machine that would last and that I could begin using as soon as it arrived. It needed minimal, if any, cleaning and a new ribbon, but that was it, except for one small matter I knew about when I bought it. There was a good bit of dried adhesive stuck to one side of the machine. I rubbed olive oil on the adhesive and patiently chipped it away with both my thumbnails, then my older daughter's thumbnails, and finally a plastic accessory to one of my son's Play-Doh sets. After almost an hour of work, not a trace of the adhesive was left. After typing a page with the new machine, I find that I will have to learn how to type all over again. (I learned to touch type on a computer--Mavis Beacon--at the age of 28, right before beginning grad school.) It will take some skill to hit the keys with the correct pressure, and I will need to be more exact in which keys I hit. I seem to hit more than one key at a time, which causes the typebars to stick. I do enjoy new challenges and I am having trouble not typing, so I look forward improving. One thing I didn't get in the mail today was the new printer/scanner that I ordered. As soon as that arrives, I will begin typecasting. I can't wait to do this, but I do get some time to practice before exposing my lack of skillful typing to the rest of the world. Today should be my last day without the ability to typecast or write on a typewriter. My first typewriter, an Olympia SM9 (the first edition with the turquoise keys and DeLuxe badge), is scheduled for delivery tomorrow afternoon. This first typewriter is a birthday gift to me from my wife. It's the first time she's bought me a typewriter, but it's not the first time she has wanted to buy me one. 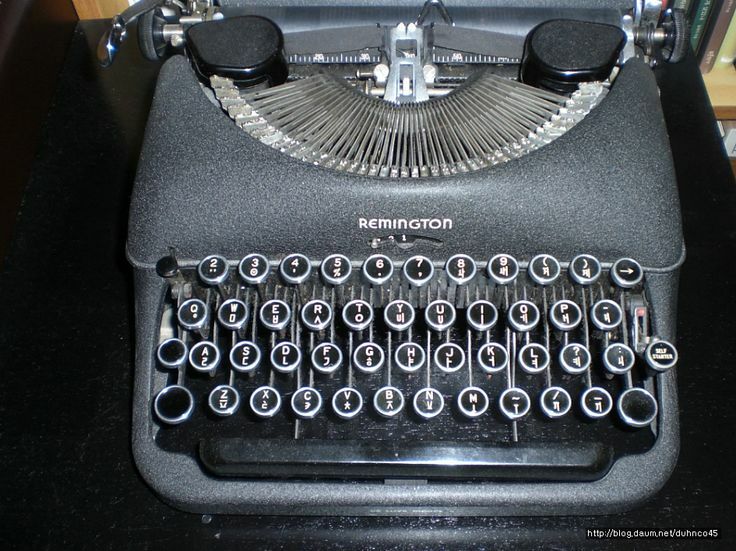 And while watching California Typewriter did help encourage my obtaining my first typewriter, I have wanted a typewriter since one romantic day in October of 1996. On that day 21 years ago, my girlfriend, the woman to whom I've now been married 18 years, and I were walking around Insadong, a small neighborhood in Seoul, South Korea, popular for cozy tea shops, porcelain goods, and antique stores. It started snowing while we were out, and the snow, the dark wood and warm fires of the tea shops, and the nostalgia-inspiring antique items made the day quite special for our new relationship. In one of the antique stores, I found a red portable typewriter from the 1930s. I don't remember the make or model, but I do remember it came with a case and had the original manual. (And, yes, it was a QWERTY keyboard. I've never seen a Korean typewriter keyboard, although they do exist.) I don't know from where the inspiration came, but I told Tisha, "I would really like that typewriter." I had never wanted one before, and I actually had never typed on one. In fact, I didn't even know how to touch type. I did have a degree in English literature, but I always had someone type papers for me, and then I began hunting and pecking them myself after gaining access to a PC and word processing software. That red machine, though. I wanted it. I wanted to work on it. I found it inspiring. I asked the price and discovered I couldn't afford it. However, Tisha offered to buy it for me. Her generosity made me uncomfortable. I wasn't a person who did well in relationships. I rarely took them seriously, and, honestly, I was too self-centered to make them work. Even though I saw a future with Tisha that I hadn't with anyone else, I didn't want to feel indebted to her, nor did I want a reason to feel guilty in case we never saw each other again after she left Korea the next month. (My employment contract required that I stay until the end of December.) So I discouraged her from buying the typewriter, and she didn't buy it. Had I known, though, that we'd still be together, that we'd marry, that we'd have three kids, then I would have let her buy that machine. Or if I had been a better man, one who would receive gifts without feeling indebted, who didn't have a need to control every aspect of every relationship, then I'd have a great wife and a wonderful red machine. But then tomorrow, I might not be expecting that SM9.